Wisconsin Stout Junior Kasey Bass is what many scouts would consider a "Diamond in the Rough" kind of player. 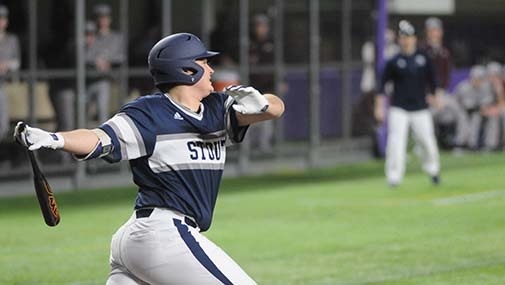 In 2018 Bass saw action in 23 games, started 20 games while earning earned all-WIAC honorable mention honors His power was on display last year as he led team in home runs with four, all against conference opponents. His first career home run vs. Illinois Tech. Bass's also led the team in slugging percentage at .527. Well in 27 At-bats Bass has 11 hits-6 Runs scored-6 RBI's-5 Doubles-1 HR. What's even more impressive though beyond the flashy offensive statistics are his strikeout to walk rate. Bass has struck out 3 times compared to walking 4. That tells opposing teams he doesn't chase many pitches outside the zone, but his contact percentage is well above average. Overall in 2 plus seasons with the Stout Blue Devils he has a .309 Batting average/.512 Slugging/.401 OB percentage. We know the power is there when it comes to the mighty bat of Bass, but man can you dream of having this guy in the middle of your order with men on base. In the day an age of where our game is today the 3 true outcomes (Walks-K's-HR's) Bass doesn't strikeout (less than one strikeout per 3.5 at bats) makes his a valuable player for any club. It just so happens though the Bristol Blues will have him for the entire summer and we CANNOT wait to witness his talents this year!